I feel like it was just yesterday I was going through Essence Crazy Good Times preview photos and could not believe it when Maestra called to tell me that we already have this TE in Ljubljana. She was a doll and got me all 6 nail polishes. Colors I like – pretty much all of them … yes – even lime green. Formula on the other hand is not the greatest. Some of them apply like molten chewing gum. Blue one had to be almost stippled onto the nails. I’m guessing they needed more jelly like formula to suspend all that glitter, but I think they went little bit overboard. You can see nail wheel swatches and glitter close up in Essence Crazy Good Times trend edition video. Colourbration I was hesitating about. Should I get it? On one hand it didn’t really look like my color (and swatches are still sparse for this TE) but on the other hand I need colors like this in my collection. And I must admit that this color works for me. 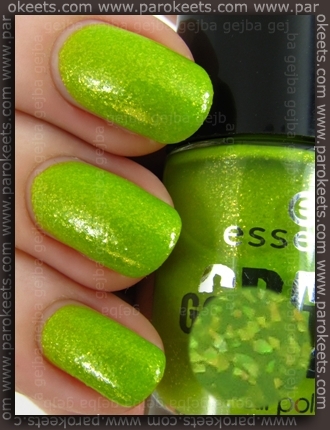 Tiny yellowish/greenish/orangy flakies make this shade alive and more wearable. I used two thicker coat because of the rubbery formula and no top coat – that is why surface looks rough. Candyction I was most looking forward of. It’s filled with flakies – do I need to say anything more? Unfortunately flakies are not that visible as they are too close color-wise to base color. Formula is better than the Colourbration one, but still not something I could say that is easy to work with. IRL color is more orange-y with slight peachy undertone. Princessorize is something for pink nail polish lovers. It’s complex pink shade with blue flashes + almost reddish pink shimmer. This one was not that hard to apply, but it does leave VNL after 2 coats. 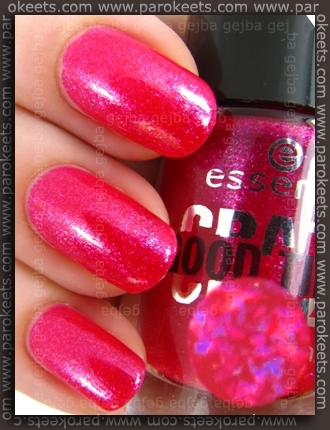 Now, if Essence put flakies in Confetteria instead of hexagonal glitter, I would adore this shade. Lovely dark blues base with starry glitter as backdrop and lighter blue hexagons to spice things up. As I already said, this one was hardest to apply. I literally had to tap the polish onto the nails as I would had to use huge amount of polish otherwise just to apply one coat. Second coat went on easier. And it has really weird smell to boot. Glitterastic glittery bomb was very pleasant surprise. Silver hexagons blend perfectly into mini silver glitter base to achieve one very sparkly nail polish. Nail line is visible pretty much only on photos as all that sparkle masks it IRL. 2 coats + top coat. As Glitterastic was the most sheer (and easy to apply) polish from Essence Crazy Good Times TE, I used it as layering polish over Paradelade. 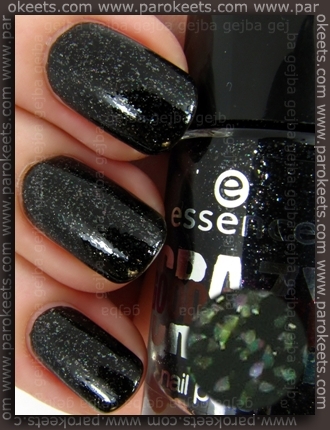 Paradelade is nice black nail polish with loads of primarily silver glitter, but nothing I would be really impressed with. And the formula was jelly-sticky. 2 coats + top coat. Realisticaly speaking, I’ll probably reach the most for Glitterastic and Candyction, but I think Colourbration will come out to play too in spring/summer. Which one is your favorite? How do you find Essence Crazy Good Times formula? I still haven’t tried out these eyelashes, but I have a feeling that they are not that comfortable. The seam looks pretty thick and not very bendable. 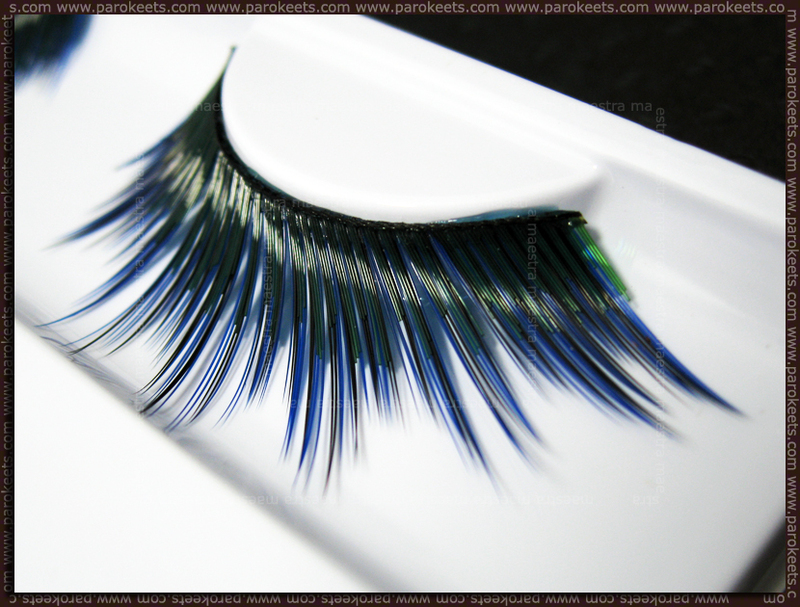 It’s obvious that these are plastic eyelashes (shine gives them away). 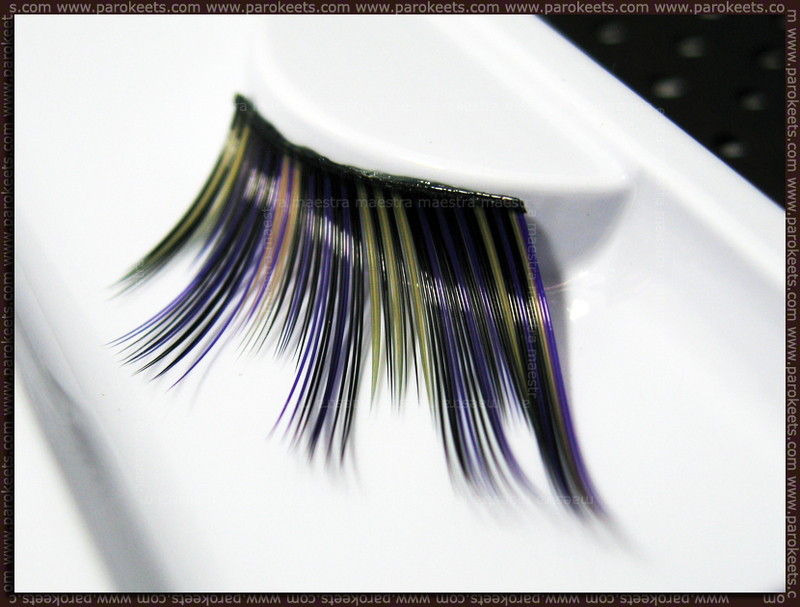 They are long and colorful and as such suitable for the bold users or special occasions. I bought them because they com in pretty colors and the price was affordable. Hmm, zakaj imam občutek, kot da sem tole že komentirala? Možno, da je bilo preko FBja. :undecided: Sem se znašla pred polnim stojalom, pa me noben ni prepričal toliko, da bi ga vzela. Je pa res, da zadnje čase tele LE kar dežujejo, morda sem se jih nasitila. Ampak swatchi so pa super! I want some polishes from this collection (esp the lime one) but I’m scrared I won’t find it because some people already found it but not me… even if it’s supposed to be on stale in Feb.
Sigh…I guess they’re never coming here…if only I had knew before…I didn’t find any info on website! These all look amazing!! I don’t know about the lime green though, lol. wow, Colourbration is the craziest colour!!! :w00t: I thought flakies would be more visible in Candyction, what a pity! 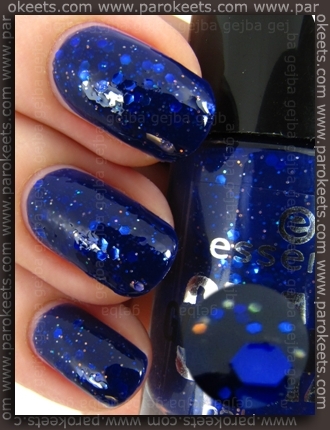 Confetteria looks really cool, so does the Paradelade + Glitterastic combo :thumb: ! Samo v Mullerjih?? Nee=/ Pa bo spet lov! Prekrasni so, sploh Colourbration je lep <3 Res upam, da ga dobim! omg i’m in love with this LE! too bad i still have to wait a few weeks till this one is in the netherlands as well! have you already seen Marble Mania trend edition? The polishes look great! 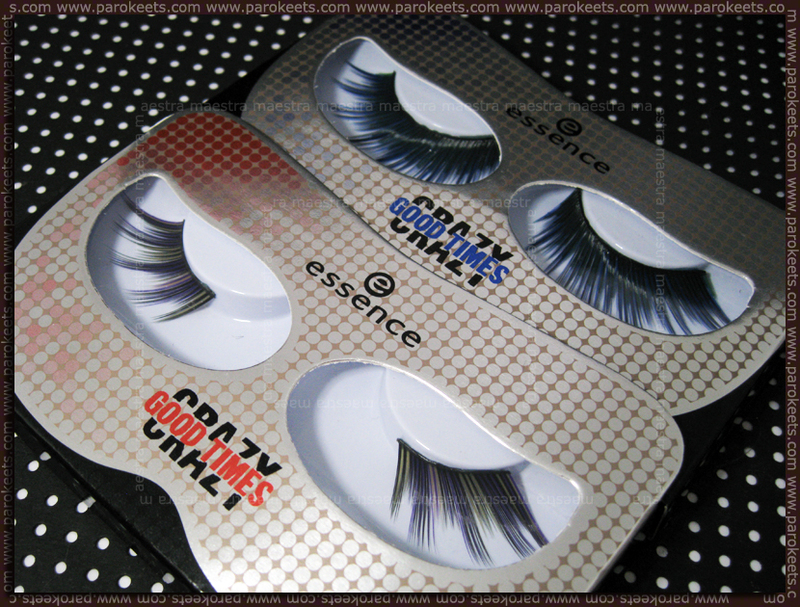 I have to have some of these lashes! The last one looks so gergeous! the false lashes are so beautiful! !